CST is charged on interstate sales, by the central government, but collected by that state government in which sales have been made. On the contrary, VAT is a state-level multipoint tax, imposed in the value addition in the product, collected at various stages production and distribution. It contains a provision of set-off for the tax paid at the earlier stage. There are hundreds of sale transactions that takes place every moment around the world. The selling price of the product includes the amount of sales tax, which we never recognize. When we talk about sales tax, both Union and State government have the power to impose a sales tax, wherein the Central government can charge tax on the interstate sale or purchase of goods. 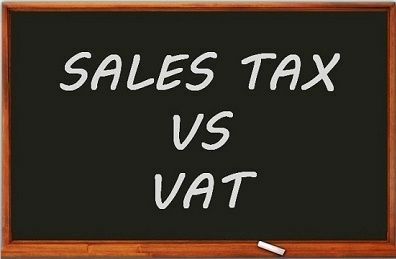 The tax charged on the sales can either be Central Sales Tax (CST) or Value Added Tax (VAT). Take a read of the article given below to learn the differences between the two consumption tax along with their meanings, in tabular form. Account maintenance Requires less effort because it is simple and easy to calculate. Proper accounts should be maintained as it is comprehensive and complex to calculate. Tax Burden Falls on the consumer Rationalized. Area Applies to the whole country. Applies within the jurisdiction of the state. The type of indirect tax levied by the Central or State Government on the sale or purchase of merchandise is known as Central Sales Tax. The tax is applicable in the whole country. It is an indirect tax because the tax burden falls on the consumer, but the responsibility to recover it, from the consumer and submit the collected tax to the tax authorities falls on the retailer or seller of the goods. Central Sales Tax is levied by the Government of India on interstate sales, whereas the State Government imposes the sales tax on intrastate sales. However, many states have adopted their own Sales tax Act (VAT Act) on which tax is charged on the commodities at various rates. There are many commodities which are still beyond the range of Sales Tax and that is why they are exempt from tax. In India, the tax is charged more on luxury goods or items of high cost or whose consumption is not good for health and the tax is charged less on necessities. The tax, which is charged on the value addition to the commodity by each party is known as VAT. In other words, it is the difference between total output tax and total input tax. Here input tax refers to a tax on inputs, i.e. local purchases made from a registered dealer whereas output tax means a tax on outputs i.e. tax on sales made within the state. VAT is an acronym used for Value Added Tax. It is a multilevel tax, which is charged when the transaction takes place in every single point of production and distribution. It is a destination based tax. Sales Tax is a tax on sales. Value Added Tax is a tax on value addition done by each party of the supply chain like supplier, producer, wholesaler, distributor or retailer, etc. Sales Tax is a single-stage tax, but VAT is a multi-stage tax. In VAT, the chances of tax evasion are very less as compared to Sales Tax in which evasion of tax can be done easily. Double taxation is always there in case of Sales tax, whereas VAT is totally free from cascading effect. The sales tax is levied on total value, but in VAT tax is charged only on the value added to the commodity. Sales Tax is easy to calculate while VAT calculation requires time and effort. In Sales Tax, the tax burden is borne by the consumer. On the other hand, the tax burden is rationalized. Input Tax Credit (ITC) is available in VAT but not in Sales Tax. The authority of levying sales tax is in the hands of both Central Government and State Government, but VAT is levied by the State Government only. In India, VAT was introduced for the first time in the year 1986 as MODVAT i.e. Modified Value Added Tax but because of some shortcomings, Central Value Added Tax (CENVAT) was brought by the Government in 2000. Haryana became the pioneer in the adoption of VAT system for the first time among all states of the country. Thereafter, some other states followed the footsteps of Haryana and opted to apply VAT. At present, VAT is applicable to all the states in the country. From past few years, Sales tax is suffering from some controversies like it lacks transparency and double taxation which is the very reason for tax evasion. That is why Sales Tax has been replaced by VAT. Excellent Article. Gives precise information. Very useful. This is the key site to enhance our ‘power of concept’, Whenever I, in demand of differences between anything I always go to your site i,e. keydifference.com. Realy this site is very much helpful to us to clarify the basic concept of any topic. The language by the author of this site is so amazing, easy to understand particularly for the student. Thanking the developer and authors of this site……………………………………………………………………………………………………keep it up. Thanks for the brilliant information. The same information is copied in Akash (BBA 4th semester solved papers book).